With the release of Street Fighter V, Capcom is altering its approach to post-launch content and, specifically, how said add-ons can be accessed. In an official guide, the company notes that “all balance updates will be available for free,” while the new system is designed in such a way that those players that remain engaged are consistently rewarded. Fight Money acts as Street Fighter V‘s in-game currency, and can be earned be completing various events such as the game’s individual story segments (10,000 per character), along with levelling up any given character (1,000 bonus per level). Winning online matches also rewards players with Fight Money, though it’s unclear at this time exactly how much. 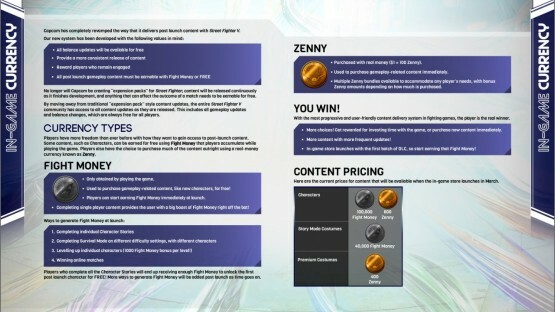 Beyond that, there’s also SFV‘s premium currency “Zenny” that can be purchased in exchange for real money. According to the post, $1 is equivalent to 100 Zenny, with additional DLC characters — namely Alex, Guie, Balrog, Ibuki, Juri, and Urien — costing 100,000 Fight Coins each or 600 Zenny. All content will be available through Street Fighter V‘s in-game store, which is due to go live in tandem with the story mode in March. Here’s the image in question, and remember to click on it to open up a larger version. Street Fighter V is available now across PlayStation 4 and PC. To get the skinny on Capcom’s brawler, check out our own verdict of the fighting sequel.